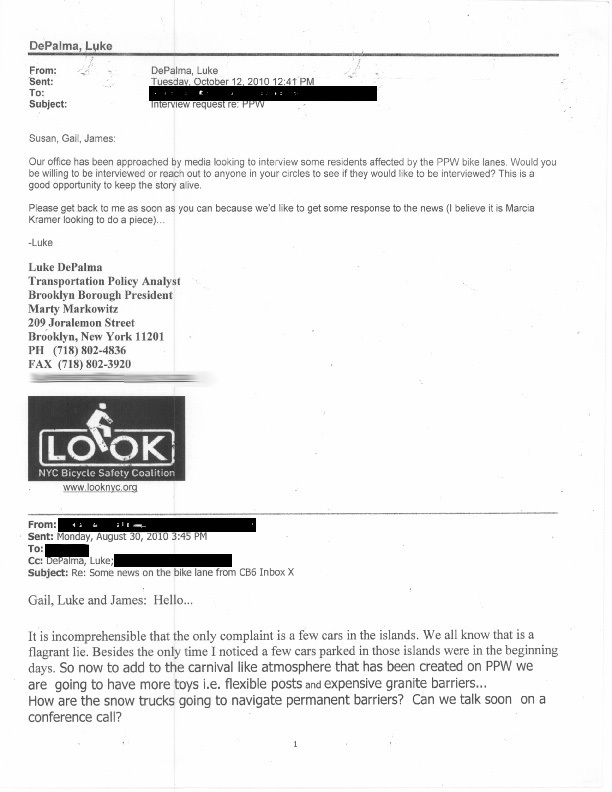 Streetsblog is starting to reveal some of the documents it received as part of a FOIL request from the major players in the lawsuit to remove the highly popular Prospect Park West bike lane. There’s some rich irony in a city employee whose email signature includes a graphic from a city-sponsored bike safety organization trying to broker a newspaper article or TV segment with the overall goal of killing a vital bike safety project. I wonder if that jibes with the Bicycle Safety Coalition’s mission? 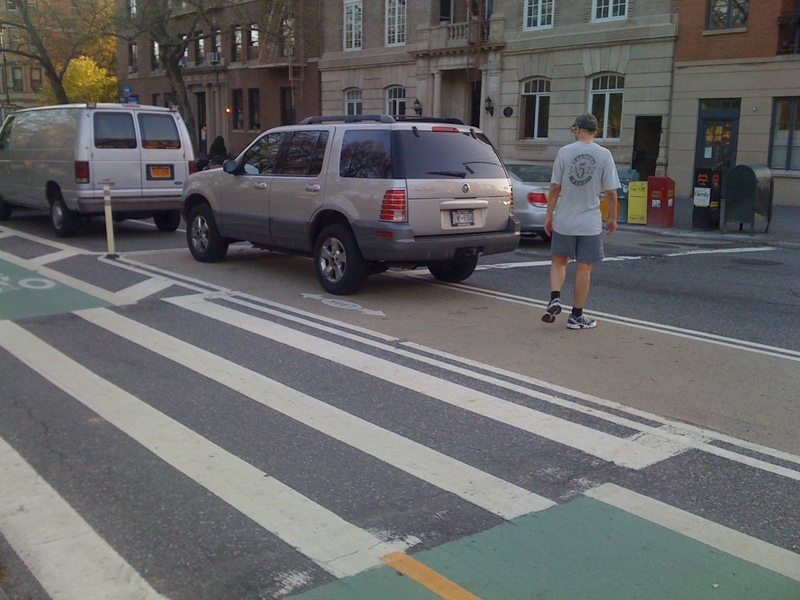 The New York City Bicycle Safety Coalition was formed in 2006 in response to a 40% increase in cyclist fatalities over the prior year in the five boroughs. The Coalition is comprised of a range of parties who have one goal in mind: to make the streets safer for everyone. There’s some even richer irony to be found in DePalma’s comment that “This would be a good opportunity to keep the story alive,” and in the response, presumably from Susan, that bemoans the “carnival like atmosphere that has been created on PPW.” If you want the carnival to leave town, don’t request a conference call someone who want to “keep the story alive,” especially if that person works for someone who turned his State of the Borough speech into an anti-bike lane carnival. And what to make of this quote? “It is incomprehensible that the only complaint is a few cars in the islands. We all know that is a flagrant lie. Besides, the only time I noticed a few cars parked in those islands were in the beginning days.” The old NBBL confirmation bias rears its head again. Well, it’s been nearly a year since the bike lane went in. We’re well past its “beginning days” so we must not need “toys” and “expensive granite barriers*” to keep the pedestrian areas free from double parked cars, right? *See the comments for the difference between the “expensive granite barriers” mentioned in the email and the inexpensive concrete islands that will be installed soon. The “expensive granite barriers” comment refers to an interim plan, floated by DOT late last year, that proposed placing large granite blocks along the perimeters of the pedestrian refuge areas in order to combat flagrant, perpetual illegal parking in the refuges. Won’t be necessary once the at-grade refuges spaces are replaced by pedestrian islands. Thanks for the clarification, Eric. Asterisk revised. I still think it’s funny that the writer assumes that drivers will eventually learn to not park in the ped refuges after the “beginning days,” as if all they need is an adjustment period to get used to the thing. She should tell her fellow NBBL members who, as of last month’s CB6 hearing, still thought pedestrians wouldn’t know to look both ways before crossing the bike lane.